Create a new WhatsApp Chatbot- You can click on the first green icon to integrate any WhatsApp number and create a chatbot at the same time. Learn more. Create a new Messenger Chatbot. You can click on the second blue icon to integrate a Facebook page and create a chatbot. Create a new API chatbot. If you've integrated a third-party channel into Landbot's dashboard, you can click here to create a chatbot for it. Learn more. Click on Builder to begin your creation. 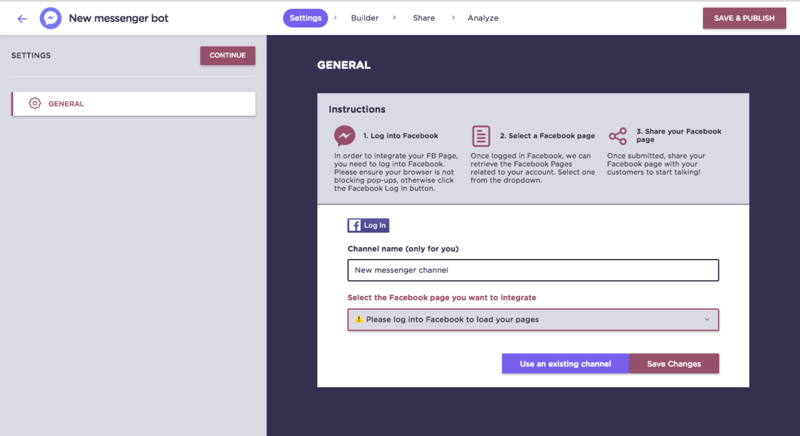 You might notice fewer features that in landbot's chatbot builder and that's due to Facebook's limitations in terms of interface. That's why you can't create the same chatbot for both landbot and Facebook Messenger. Please, note that at the moment not all the Landbot features are compatible with Messenger Bots - like Searchable options, multi-answer, external URLs in buttons and YouTube video integration. Whenever you're done with your creation, click "Share" on top, where you'll find your Facebook Page's URL in order to share it, and the possibility to use other Social Media apps too. 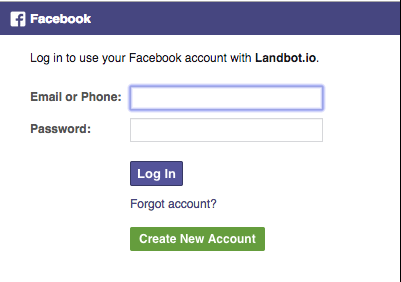 Feel free to test our Messenger Landbot! When it came to FB Messenger integrations, FB requires you to update the token every couple of months. The tokens have to be manually updated. To do so in Landbot, please move on to Dashboard > click on your Avatar on the top right > click on Channels > click on the Facebook Messenger channel > Edit > Save Changes. This process automatically renews the token, and it's always the first thing to try when the sending/reception fails!